We're a national leader in disaster response and recovery services in terms of experience, quality of service, technological and operational innovation and financial strength. AshBritt Environmental is a national turnkey rapid-response disaster recovery and special environmental services contractor. Since our inception in 1992, we have managed and executed more than 230 disaster recovery missions and numerous special environmental projects; successfully serving clients all over the country in their time of need. Our extensive experience has created an abundance of knowledge and experience for our principals, managers, and personnel. Our senior management and technical consultants have more than 200 years of combined experience with all facets of disaster recovery efforts including debris removal, management, reduction, processing, recycling, and disposal, as well as emergency planning, damage mitigation, and risk abatement. Since our inception in 1992, we have managed and executed more than 230 disaster recovery missions and numerous special environmental projects; successfully serving clients all over the country in their time of need. 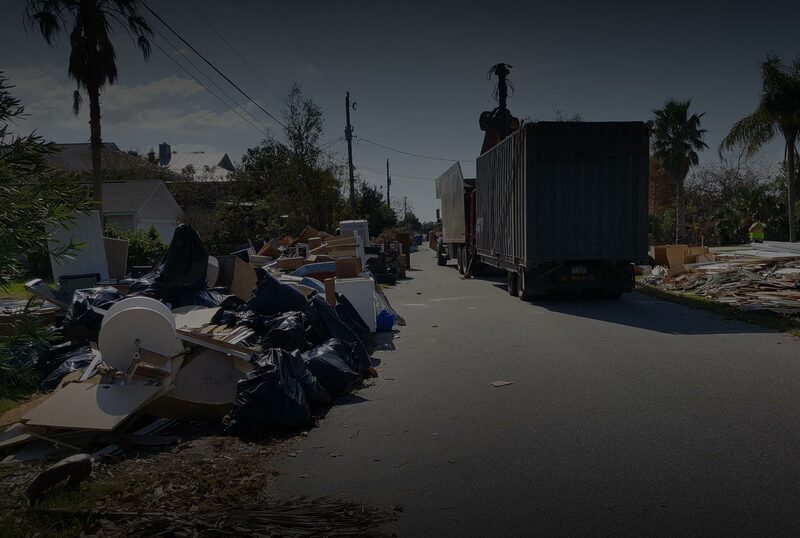 We have been directly involved in the debris recovery efforts of 50 federally declared major disasters in 18 states, beginning with Hurricane Andrew. All of these recovery missions were conducted under the authority and oversight of FEMA. This mission was part of the long term recovery efforts in the City of Houston post Hurricane Harvey. AshBritt was assigned various zones within the city to conduct debris clean-up in residential neighborhoods. 82,720 pounds of dead fish removed. AshBritt led the collection and disposal during a fish kill mission for St. Lucie County, FL due to a Red Tide Algae Bloom. In the aftermath of Hurricane Irma AshBritt activated in over 70 jurisdictions across Florida, South Carolina and Georgia. AshBritt Conducted emergency road clearance, Right of Way vegetative debris collection, Debris Management Site management, reduction of vegetative debris through grinding, white goods collection and haul out services. Additionally, AshBritt conducted waterway collection services and provided ancillary services including vacuum and fuel trucks. 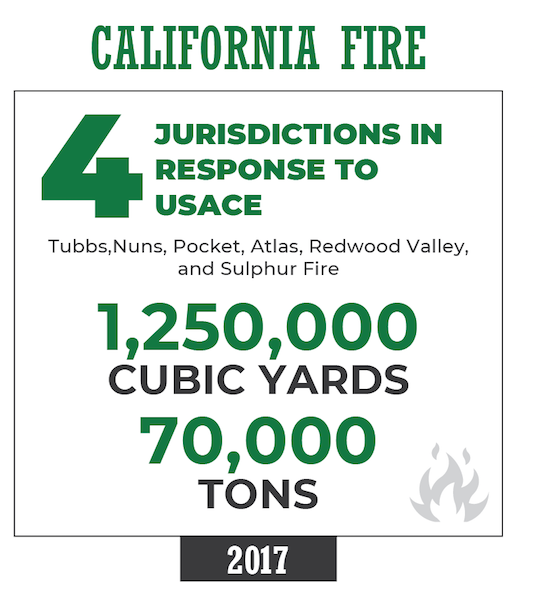 AshBritt Inc. responded to the Tubbs, Nuns, Pocket, Atlas, Redwood Valley, and Sulphur fire for the USACE (2017). 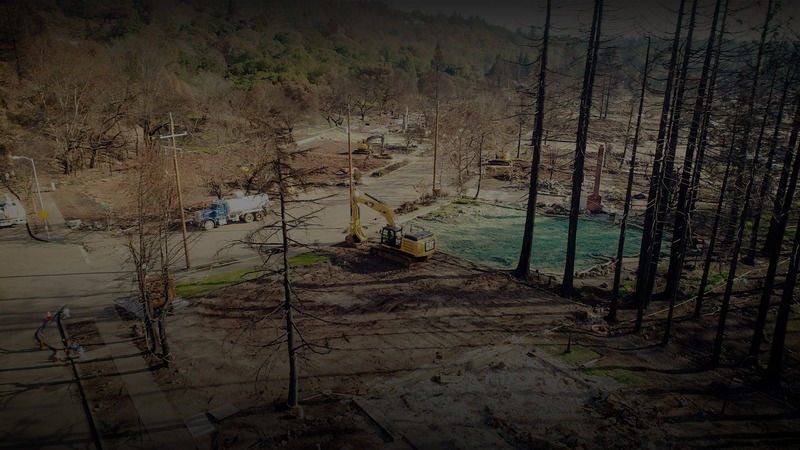 AshBritt was tasked by the USACE to conduct a Private Property Debris Removal (PPDR) operation for fire damaged homes and structures in Sonoma, Napa, Mendocino, and Lake County, CA. This work included removing contaminated soil, ash, metal, concrete, and other related debris streams on over 1,900 properties. AshBritt removed over 770,000 tons of fire debris within the four counties. We also performed air monitoring and implemented erosion control methods throughout the entire project. For this operation, we certified over 1,700 hauling units and utilized over 200 pieces of loading equipment. At our peak, AshBritt had over 115 debris removal crews working and moved 25,000 tons of fire debris in one day. 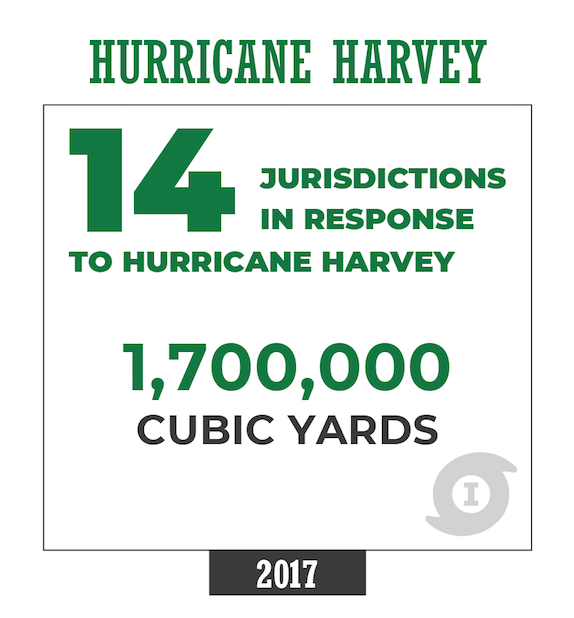 In the wake of Hurricane Harvey AshBritt activated in 14 jurisdictions across Texas. 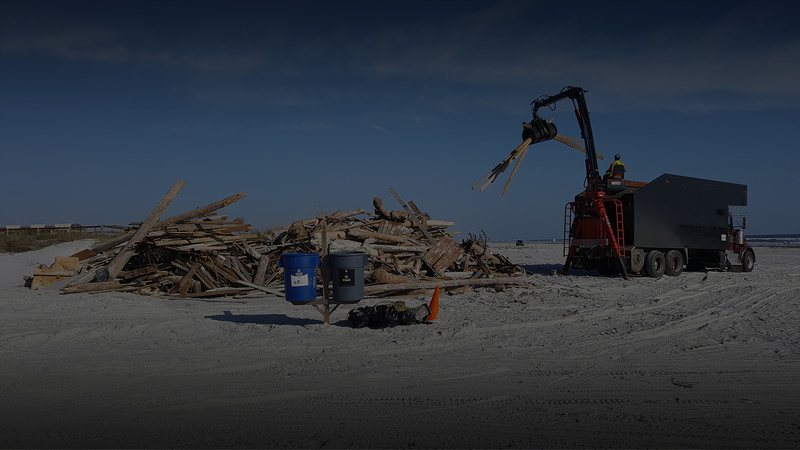 AshBritt conducted Right of Way vegetative debris and C&D collection, white good collection, Debris Management Site management, reduction of debris through grinding and compaction, and haul out services and provided emergency water services. AshBritt provided Ancillary Services on two seperate missions related to the BP oil spill. AshBritt provided staging, deployment, maintenance, repair and removal of approximately 95,000 linear feet of oil deflection boom and provided the same services for another 11,000 linear feet of oil deflection boom. AshBritt conducted public right of Way collection for vegetative debris, C&D, and white goods as well as freon removal. AshBritt also removed debris streams due to flooding. AshBritt led the collection and disposal of deadfish mission for the City of Longboat Key, FL. This included the utilization of a 33’ Tri-toon boat to collect, transport, and dispose of dead fish due to a Red Tide Algae Bloom. AshBritt deployed equipment and manpower to Virginia following severe rainstorms that produced high winds and knocked over trees. Through activation of our county contract, AshBritt was specifically tasked to assist with debris clearing, and removal from the public Right of Way. AshBritt oversaw the relocation of flood waters from multiple low-lying communities throughout the County through the utilization of Super Vac Trucks and pumps. Located, established and operated a vessel aggregation area for 42 sunken or submerged vessels recovered by AshBritt. AshBritt was activated by the state of New Jersey and 53 municipalities. AshBritt identified and designated collection zones in each municipal jurisdiction. We sourced, retained and assigned subcontractors for all collection zones. 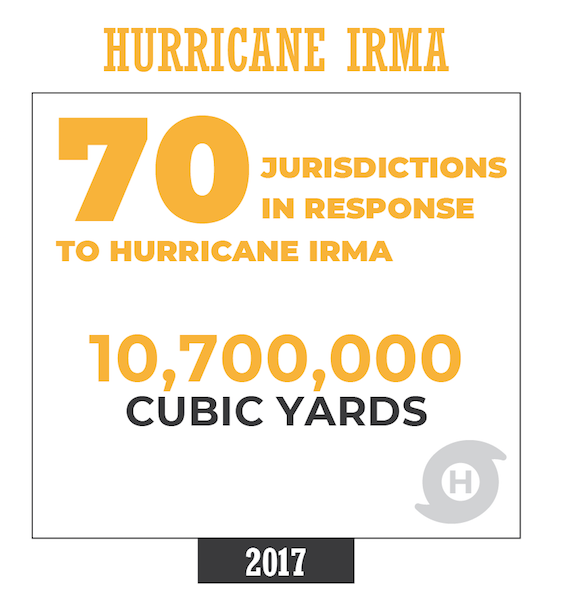 We developed, staffed and operated 42 DMS sites throughout the affected areas and collected and hauled 3,000,000 cubic yards of debris in 90 days. In total 3,171,531 cubic yards removed, managed, processed and disposed. On September 13th, 2008 Hurricane Ike made landfall in eastern TX as a strong Category 2 hurricane bringing winds of 100 mph as well as significant storm surge. AshBritt responded to 15 jurisdictions in the state of Texas in order to assist with various disaster recovery needs. AshBritt has identified two signature projects that were conducted in order to give a better overview of the type of services AshBritt provided during this event. Collected, processed and disposed of 620,000 CY of disaster generated debris. Tasked with asbestos abatement of 35 residential homes that had to be condemned due to floodwater inundation. AshBritt’s certified asbestos abatement crews removed shingles, siding, tile and other materials that contained friable asbestos and disposed of it per local regulations. Handled over 11,000 White Goods, of which 4,300 required Freon Extraction and 4,800 required decontamination owing to putrescent food and other substances. Collected and processed over 195,000 pounds of household hazardous waste (HHW). We collected approximately 7,500 loads of debris utilizing 140 hauling vehicles. On October 29, 2011 much of the State of Connecticut was blanketed by as much as 27 inches of wet snow due to an early season snowstorm resulting in extensive vegetative damage. Approximately 800,000 residents were without power. AshBritt’s contract was activated by the State initially for emergency road clearance operations. AshBritt subsequently received 17 disaster debris management task orders for municipalities and three for state agencies including the Connecticut Department of Transportation. Statewide operations included the removal of hazardous hanging limbs from 86,210 trees, the removal of 11,185 hazardous trees and the loading, hauling, reduction through grinding and disposal, through beneficial re-use, of 1,835,101 cubic yards of vegetative material. 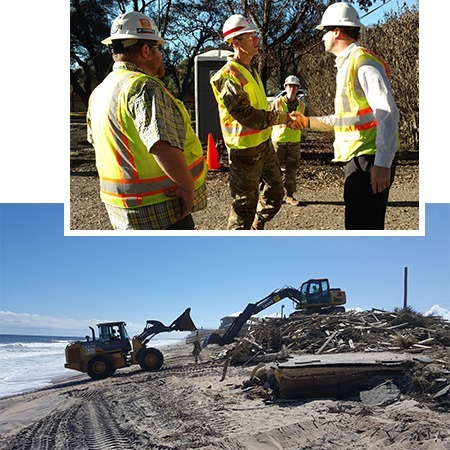 AshBritt utilized company owned equipment as well as the support of 141 subcontractors utilizing over 1,293 pieces of rubber-tired equipment to assist in this large storm- generated debris management project. AshBritt had more than 55 personnel including corporate principals, senior project managers, safety officers, project managers, quality control representatives and administrative staff. 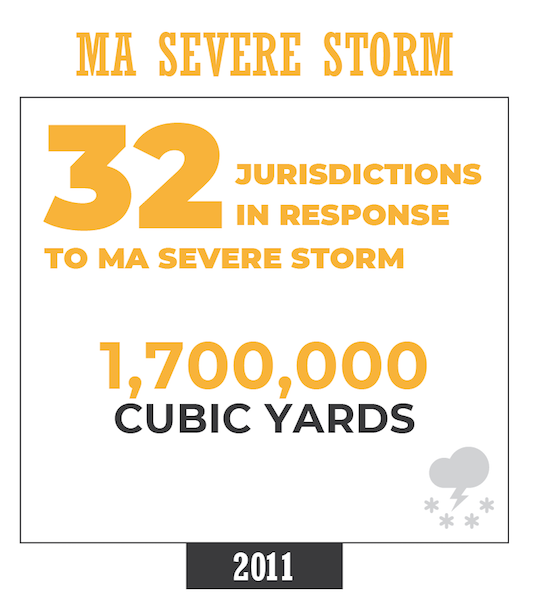 On October 29, 2011 most of the state was blanketed by as much as 27 inches of wet snow from the Massachusetts Severe Storm and Snowstorm. This event generated massive amounts of hurricane like vegetative debris. AshBritt received separate task orders from the State for emergency road clearance operations in various municipalities. Additionally, the state offered the contract to all municipalities and public agencies for large volume debris removal, management and disposal operations. Twenty separate municipalities as well as the City of Springfield’s Parks Department and publicly owned Springfield College chose to utilize this contract. AshBritt removed hazardous hanging limbs (hangers) from 101,835 trees and 5,143 hazardous leaning trees (leaners). AshBritt loaded, hauled and reduced through grinding 1,774,452 cubic yards of vegetative material. All vegetative material was disposed of through beneficial re-use. AshBritt utilized company owned equipment as well as 101 subcontractors deploying 694 pieces of rubber-tired equipment. AshBritt had more than 75 personnel including corporate principals, senior project managers, project managers, quality control representatives and administrative staff working daily out of a local field office building in West Springfield, MA. 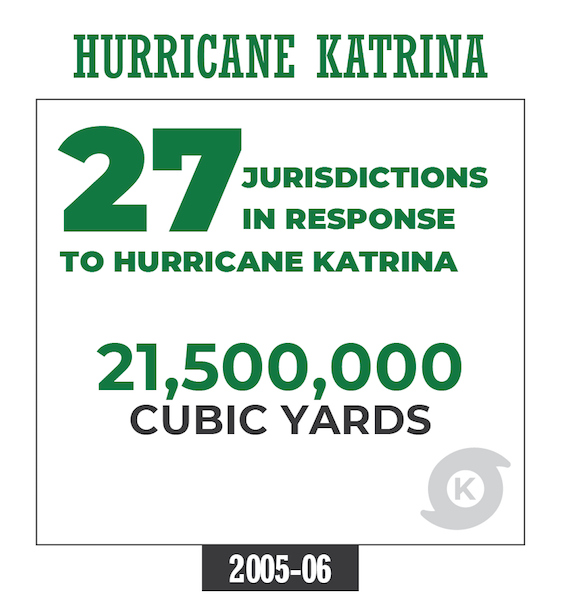 Statistics: 21,589,265 cubic yards removed, managed, processed and disposed of. Provided over 50,000 gallons of emergency diesel fuel for initial operations in LA, avoiding any equipment downtime. Collected and hauled over 1,000,000 cubic yards of debris in less than five weeks. Removed 19 tons of putrefied food from commercial cold storage facilities in Orleans Parish. Decontaminated and recycled 25,007 refrigerators and 1900 tons of spoiled food. Due to the mass evacuations for the Blue Cut Fire, AshBritt provided 40 Port-o-potties which included 15 ADA compliant units for the residents of the County. AshBritt also delivered 40 portabel showers which included 4 ADA compliant units. AshBritt had units on site within 14 hours of request. 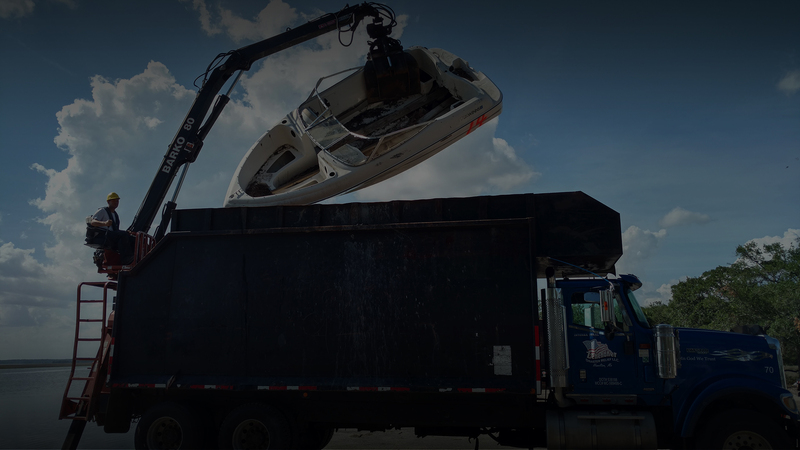 AshBritt managed debris collection, site management, haul off and disposal of debris. AshBritt provided ROW debris collection, DMS management, debris reduction, haul off and disposal. Multiple NRCS projects. AshBritt additionally managed a ROE program. AshBritt managed ROW and Debris Collection/Disposal. Now in its 25th year, AshBritt is a national turn-key rapid-response disaster recovery and environmental services contractor. 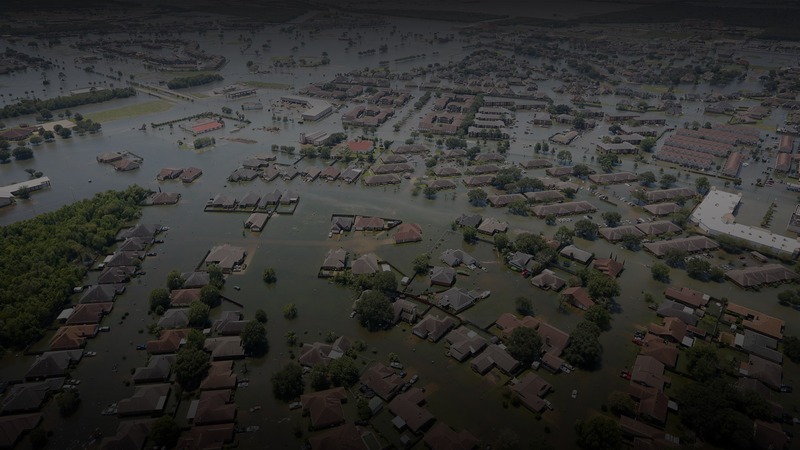 AshBritt has conducted more than 330 disaster response missions and 30 special environmental projects, successfully serving more than 600 clients. We have been directly involved in the recovery efforts of more than 60 federally declared disasters in 19 states. AshBritt has been a contractor for the U.S. Army Corps of Engineers (USACE) for 20 years and is currently the prime contractor for the South Pacific Division (AZ, CA, NV, UT, NM) and South Atlantic Division (AL, FL, GA, SC, NC). © Copyright AshBritt, Inc. All Rights Reserved.